Crowds + new train + bikes + camera = see below. Mariachi Plaza Station, from the gazebo there. Bike parking and bike lockers at Mariachi Plaza. People in the street! This is 1st Street closed for the Boyle Heights Block Party they held in conjunction with the Gold Line opening. Everyone's crowding around to hear and see a lady singer belting out baladas. Down below, people waited in line to ride the new subway to East LA. Here's the new public art in the Soto Street Station. The overhanging egg in a wire nest is a bit silly, but I really like the map of old Los Angeles overlaid with blue birds. Go see it yourself, my picture doesn't do it justice. This is the view of the LA River from the 1st Street bridge during the magic hour. And if you turn around on the bridge, you can now watch the trains approach and depart downtown LA. This is my favorite stretch of the new line, cause you can ride your bike alongside the train and wave at the people inside. Since it was a Sunday, the bridge had very little traffic. It felt like a train/ bike only bridge. What a dream! The loveliest moment of the day came when people disembarked from the train at Mariachi Plaza and clapped. I don't know if they were applauding the historic return of rail transit to East LA, or some other happy event, but it made me feel really good inside. Upon returning from Bogotá, Colombia last fall, Bobby and I helped form a committee to bring a ciclovía to Los Angeles. This month we got covered by the Los Angeles Times (Who's quoted? I'm quoted!). As proof that mainstream media has a long reach, a fellow grad student in faraway Michigan wrote to me since he is also planning to do a dissertation about bicycling. Other websites, including a drivers' forum, picked up the thread from the LA Times' website. Then ABC did a little segment on cicLAvia. Streetsblog also did a post about us. I rode fast along Virgil, pumping my legs and allowing my body to swing from side to side as I pushed up the last hill before I went under the 101 freeway. I would usually avoid a busy street like Virgil at 3:30 pm, the beginning of the tire-squealing, rage-filled spectacle known here as “rush hour,” but there is no other way to cross the 101 between Virgil and Vermont, an even busier arterial some distance west. 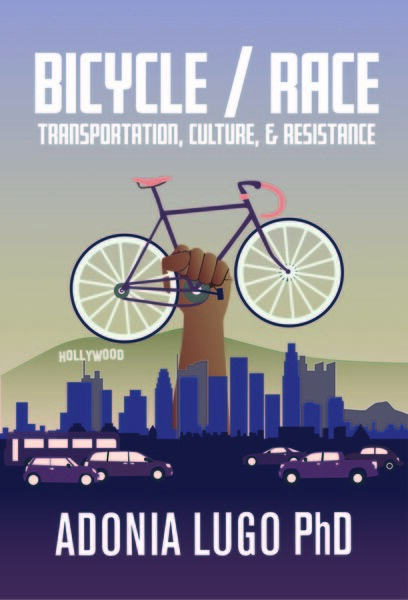 As a young person who has made the decision to live carfree in Los Angeles, I have made the transition from riding inside of cars, where too often we sit frustrated in gridlock or isolated from the city around us, to riding bikes and buses, where I no longer have to maneuver a ton of steel around hundreds of thousands of other, similar tons. Once you get outside of your car, everything changes. The sounds, the sights, your impression of humanity. Namely, many people drive so sloppily you would think they do not understand that one in fifty Americans will die in an automobile accident. What is this mass delusion that allows us to get in our cars and drive so poorly? To illustrate this point, let me tell you about some of the things I saw as I rode home from a local bookstore today. The most egregious sloppy driving I witnessed came from people turning corners: one man accelerated into his left turn, one hand clutching a cell phone to his ear, crossing into the opposite direction’s turn lane. His face registered no joy in this reckless action. A car full of young men swerved in front me a few blocks later, deciding to ignore their red light for some reason. After I made it past the freeway and coasted the last few blocks until I would leave Virgil for relatively calm neighborhood streets, a few last hazards came from people who slammed on their brakes to make turns. This caused the people behind them to slam on their brakes because they had been following very closely, with some of them swerving to avoid the nuisance of having to stop. One almost swerved into me after some person had the audacity to attempt a left turn, but thought better of it at the last minute. Finally I turned onto 1st Street to climb the last hill before my block at Bimini Place. Before I started pedaling up the hill, though, I watched an elderly man run across the street at a corner, where he legally had the right of way, to avoid being hit by the cars coming down the hill I was about to scale. They barely paused, indicating that he was indeed right to run; how dare he break the flow of their trajectory? Almost reaching my intersection, I pulled into the left hand lane and signaled my left turn, all according to the rules of vehicular bicycling. The two cars that flew past, within inches of my body, either resent the techniques of safe riding or simply don’t notice that people outside of cars do not have a two foot buffer of steel around them. Who are these people? They are parents and children, brothers and sisters. Who gets into a car and forgets everything about common courtesy in a mad rush to reach some distant destination? Many, many people make this choice, conscious or not, every day. These are not aliens from outer space inhabiting human forms, these are not drone cars driven by some future technology. As a bicyclist, I pay extra attention to drivers because so many of them apparently feel exempt from having to pay attention to the environment around them. At this point in time, this is the cost of having the freedom to move through traffic, shifting from the sidewalk to the street as needed. I get around with ease, but I'm sure as hell not going to ride around the way I see people driving, so that means paying attention to every vehicle I pass. Whether driving on your own block, or fifteen miles from home after work on Friday afternoon, you put everyone’s lives at risk when you drive recklessly. Cars are inherently dangerous. Why add to this baseline by treating your gas and brake pedals like video game controls? If you’re fed up with the vagaries of the roads, with having to sit behind rows and rows of people like you, try leaving the car at home sometime. You have nothing to lose but your ulcer. On Sunday we ventured east to Pasadena, where we ate breakfast with family in a white midcentury corporate plaza that now houses a Souplantation. Postmodernism aside, we were there to finally access the Angeles National Forest, after months of looking at those distant mountains with longing on those clear days when the haze has not swallowed them up. Not knowing much about the forest, I'd found some information about the Echo Mountain Trail to the Mt. Lowe Railway area, which sounded promising. We accessed it by following Lake Avenue through Pasadena and then Altadena until it ends at Loma Alta Drive. As we drove past the Lake Avenue Gold Line stop in my mom's car, Bobby and I realized we had found a trailhead that would be easily accessible by bike and transit. Hooray! It turned out we didn't have much time for hiking, but I consider it a thoroughly successful reconnaissance mission. The trail rises from the old Cobb Estate, and since it was a pretty hot day sweat soon covered us all. Some mountain elf we met on the trail told us that you could see a groove carved along the edge of a canyon, evidence of the old Mt. Lowe Railway's path, but I'll need to get some more detailed information for our next visit. I'm a child of Southern California mountains, since my family landed in San Bernardino in the 1890s and raised grapes in the hills there till the Depression struck. Even after she left that agricultural life, my great-grandmother took all her offspring on nature expeditions. My mother's subsequent appreciation for hiking and camping took root in me as well. The exhiliration I feel when I hit a dusty trail, surrounded by chaparral and breathing in the wafting smell of hot pines, goes a long way to making this girl feel human again.